Even if you are short on time, you can still help the PTCO in a very meaningful way by doing things you already do! If you shop at King Soopers, please help us earn “free money” by using a reloadable gift card for your groceries & gas. Simply pick-up a reloadable gift card from the PTCO, then load money onto the card using your regular credit card or cash. When you pay for your groceries or gas, with the reloadable card, Erie Elementary receives 5% of all money loaded onto the cards. Contact us to get your reloadable card. We will also be handing these out at the PTCO's table at Back to School Night! 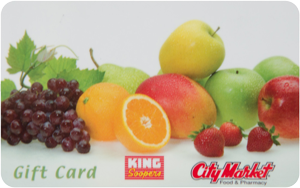 Click on the file below for more information on the King Soopers card/free money program. If you are shopping on Amazon, just use this link and money automatically goes back to our school! Easy as that! Click the button below. We collect Box Tops from a huge list of products from Hanes socks to Avery office products. Please clip and submit in an envelope or bag marked with your child's name and teacher in the donation box located in the school lobby. Box Tops expire, so please check expiration dates before submitting. You can sign up at the Box Tops For Education website to earn electronic box tops throughout the school year. Their Marketplace tab connects you with many merchants websites. If you enter through their website you can use your coupons, discounts etc. while earning ebox Box Tops for our school by purchasing items on-line. Apple Store, Office Max, Home Depot, Walmart are just a few of the sites you can shop via the internet and earn cash for our school. We collect Labels for Education. These labels are found on Campbell's products, Bic Pens, Pepperidge Farm products, Dannon yogurts, V8, Pop Secret, Swanson, Franco-American, Emerald Nuts, GLAD food storage, and Time Inc. Magazines. These labels do not expire and earn points which Erie Elementary uses to purchase art supplies, PE equipment and much more. Submit these in an envelope or bag with your child's name and teacher on it. You can register as an Erie Elementary parent at labelsforeducation.com to earn additional points. MILK CAPS for MOOOLA is a program sponsored by Longmont Dairy that helps students earn money for their school. Longmont Dairy milk caps are worth 5¢ each and are redeemable for cash. Participating is easy as 1-2-3! Save the plastic caps off of your Longmont Dairy glass bottled dairy products and juices. Clean dry caps can be dropped in the collection box located in the school lobby. Please contact Shanna Esparza with any questions or concern you may have about free money.